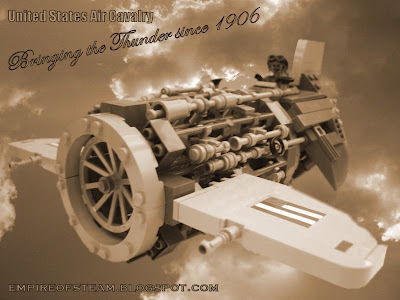 The P2 Thunderbolt first roared into service with the United States Air Cavalry in 1906. The first aircraft to successfully employ the newly-developed steamjet turbine, the Thunderbolt was capable of astonishing speed. The P2 was nicknamed "The Monster" amongst Air Cavalry pilots, at first because of the number of test pilots who lost their lives during its development, but latterly because of its fearsome reputation in battle. Initially the Thunderbolt was seen as a classic fighter, but its heavy armament and high speed also made it perfectly suited as a ground attack aircraft. "Bringing the thunder" was soon to become military slang for devastating strafing runs against ground targets. The P2 became an American military icon during the twenty years it was in service, appearing regularly in Air Cavalry recruitment materials such as the poster displayed above. When President Roosevelt summed up his foreign policy agenda with the phrase "Speak softly and carry a big stick", many believed the stick he was referring to was the Thunderbolt. Interested readers are invited to view more images of this famous aircraft here.